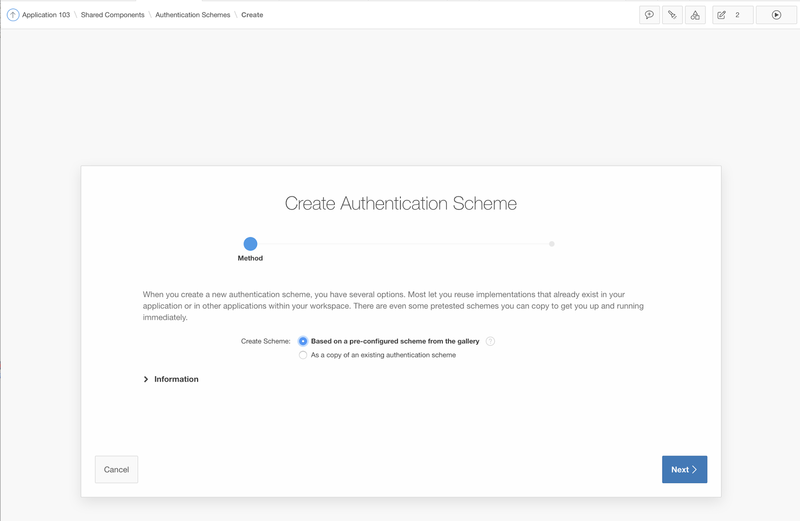 Before when creating the APEX application based on a Blueprint, we used the standard APEX Authentication, which means the management of users is done in Oracle Application Express itself. As we created our own user table, we want to manage our users there and have some custom authentication scheme for our multiplication application. 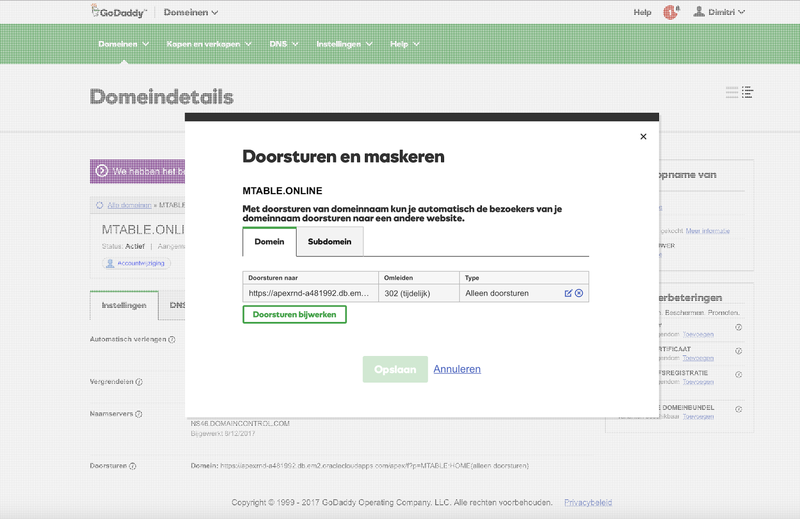 In this post I will show you exactly how I built the custom authentication scheme for my Oracle APEX application you see at the https://www.apexrnd.be/ords/f?p=MTABLEmultiplication table app. I first decided which kind of login page I wanted. 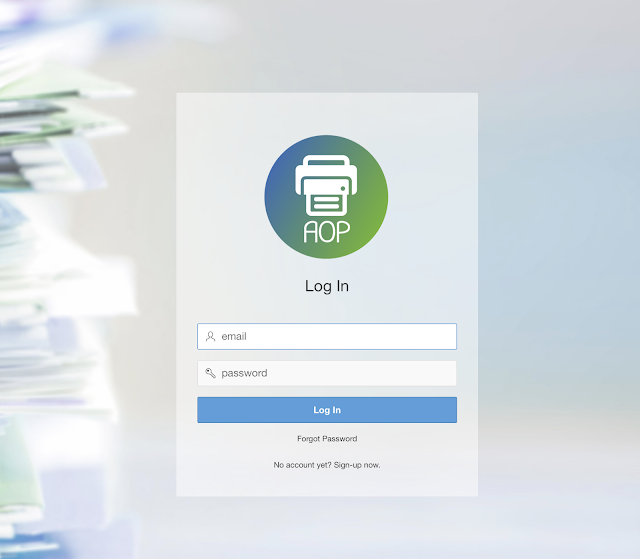 A few years ago I blogged about pimping the logging page, which is what I use on the APEX Office Print login page. This type of page is a more traditional way of building a login page in Oracle APEX. For the registration page and forgot password page we used the same techniques. For the multiplication table project I decided to do it a bit different. I started from the landing page and build the login mechanism into that page. But also the register and forgot password are on the same page, so not like what we did for APEX Office Print, using different pages for forgot password, register and login. 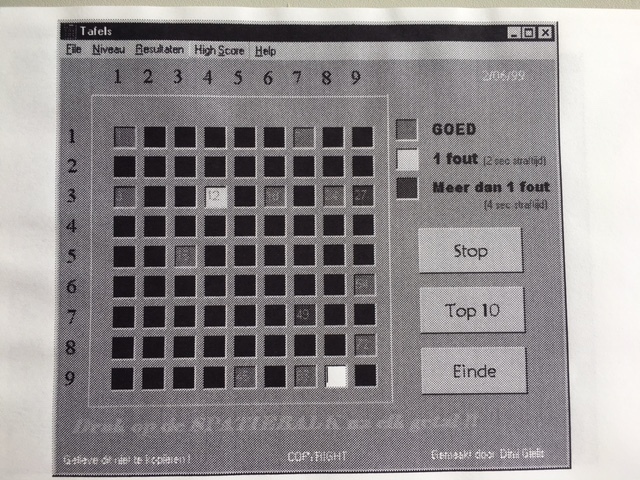 There are a few regions to help with the layout (Top, Left, Right). In the Right region, there are 3 sub-regions: Login, Register, Forgot Password, which will show one at a time. Dynamic Actions (Show/Hide) control which region is seen. From the front-end this is what it looks like. When clicking a button an APEX process is being fired, but all the logic is defined in a package. The package to handle the authentication I typically call [project trigram]_AUTH_PKG. It doesn't only contain the authentication logic, but also the registration, reset password and authorization logic. I typically use dbms_crypto to generate (hash) the passwords, but as that package is not supported on Oracle Exadata Express at the time of writing, I use another SHA256 PL/SQL implementation. I'm not going into too much detail on the logic in the PL/SQL package. I hope it's kinda self explanatory, but if you have any question, feel free to ask in the comments field. 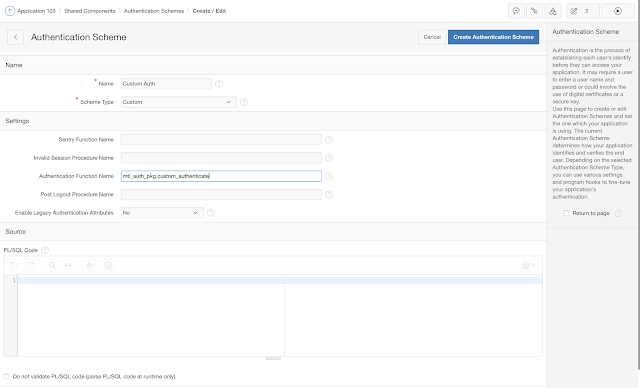 Now we will focus on creating a Custom Authentication Scheme in APEX. By default the new authentication scheme will be current, so make sure you have some data in your tables, otherwise you won't be able to login. Next I typically add some post authentication to fill some Application Items. We have now made our application accessible to people by defining our own custom authentication scheme. Next, we want to define which rights you have in the application. To do this, we will create two Authorization Schemes, one for a normal user and one for an administrator. In our package we already included a function with the logic. Every user has a role defined to him, and depending the role, it's a normal user or an administrator. An administrator can do everything a normal user can do, but can also access the administrator section where we maintain our application. I hope it gives you all the components to build your own custom authentication and authorization schemes. I also recorded a video which goes in more detail on the entire process of signing up, forgetting password and logging in and the different authorization schemes and code being used. 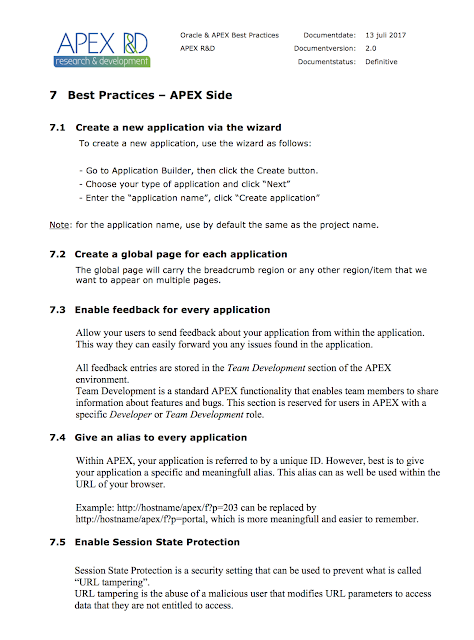 Over the years while developing Oracle APEX application, I noticed in every application I was following the same steps. It was a routine I followed over and over. For example: in every application I created a global page (page 0), enabled Feedback, ran the Advisor multiple times a week, used certain naming conventions etc. I don't like too many rules, but a few are good to have, especially when you get new people on board or when the customer is working together with you. As I said in my previous post where I described our database guidelines, the guidelines in itself is not meant to be "this is best and you have to follow", it's more something to start from which you can adapt. Based on those guidelines, we created a "starter application", so you get a head start in your project. The app in itself wasn't spectacular in itself, it contained the global page, feedback, some administrator pages which give statistics of your app, some application items, error handling package etc. If you know what you have to build, it wouldn't even take that long to build it from scratch. I just don't like to do repetitive things, I far rather concentrate on the real solution, so anything that can help, I will embrace :) I also won't hesitate to take some components or solutions from other projects and reuse those. But just one piece of advice, always check if what you've been doing before, is still valid today and "the best" way of doing it -for your current problem-. For example if you developed something in APEX 4.2, maybe in APEX 5.x there's a build-in package to do that. Or the other way, that a feature of APEX became deprecated (e.g. 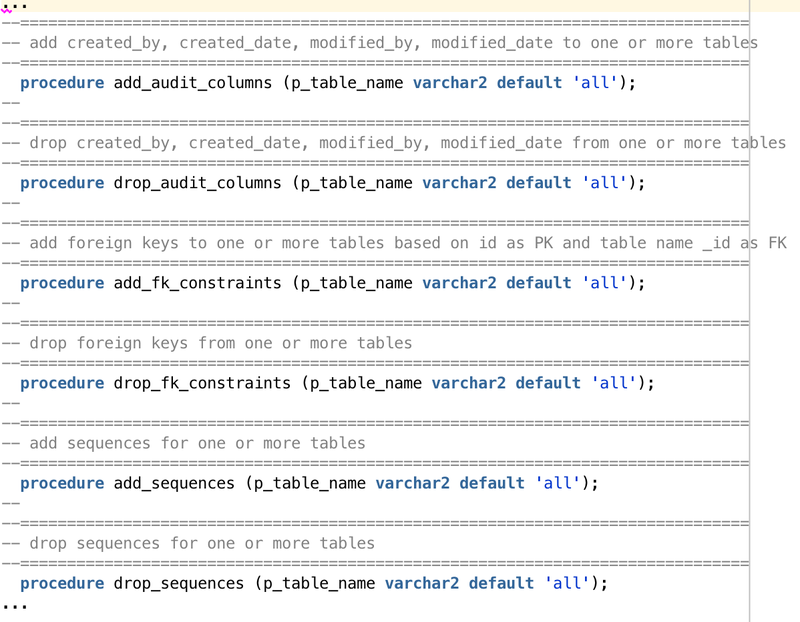 apex_plsql_job) and you should use a database feature (dbms_scheduler). In 2015 I also gave a presentation at some Oracle conferences how I developed in APEX 4.2 vs 5.0, which you find here. So I could use my starter app for this project, but just as with Quick SQL (to create your database objects), there's a new feature in Oracle APEX 5.2 that will make the starter app irrelevant, so I will cover the new way of doing something in 2017 and further. The new way of building an application, is to start from a "Blueprint". 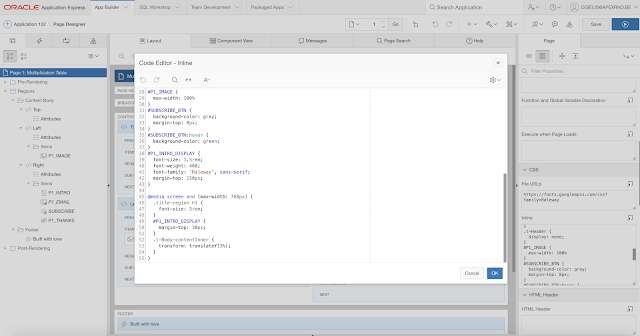 The concept is very similar to my workflow previously, but now it's built-in the APEX Builder and it's more powerful as it allows to customize the features you want to include in your app. Blueprint is at the time of writing only available in Preview mode (since March 2017) through apex.oracle.com and will probably undergo some more changes. I see a lot of potential in this feature. It's not only the wizard you can use, rumors are you can also use JSON syntax to define your app. At the time of writing Blueprint isn't finished yet. Not sure what the end result will be, but although there's still a lot of room for improvement, it already looks spectacular. 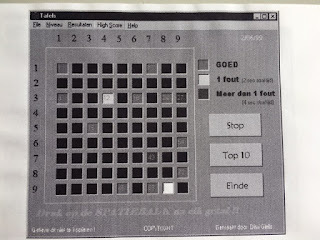 As you could see in the video, I will use it as my starting point for my multiplication table project. I've exported the app of apex.oracle.com and imported in my Oracle Exadata Express environment. Next I'll make changes to this app and customize further. 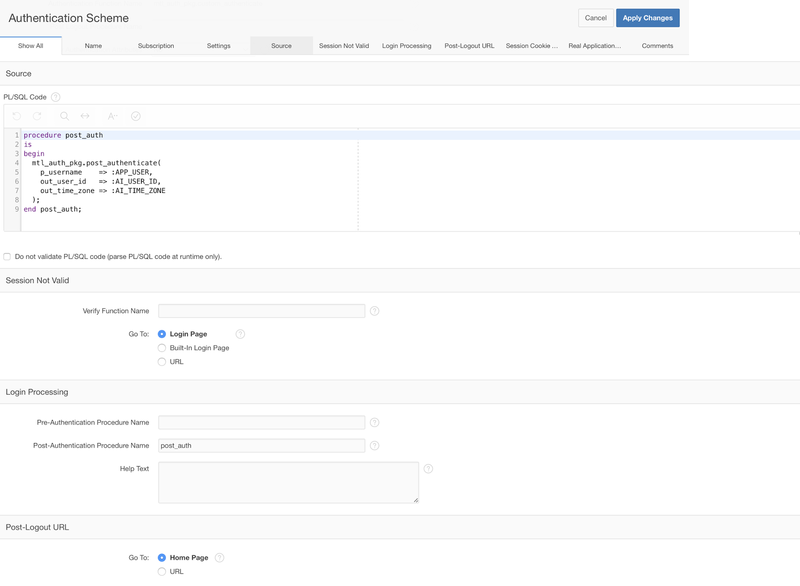 Blueprint is (or will become) the fastest and most low code way to build an Oracle APEX application. Update August 19th: on apex.oracle.com a new version of Blueprint is available with even more options than you see in the video. When you launch an app or service, you probably want a domain name. I register all my domain names with Godaddy. I'm a long time customer with them and I find them really reliable, not that expensive and they have good support. But I find it hard to come up with "the right" domain name. 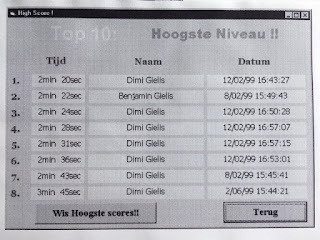 For example for our project I wrote on a piece of paper all different domain names: multiplicationtable.com, multiplicationstable.com, multiplications.edu, multiplicationtable.online, multiplicationtable.guru etc. Once you have the domain name you want to link it to your Oracle APEX application. In a future post I will cover Reverse Proxy and SSL, but for now, as I want you to see what is happening, I just configured in Godaddy to redirect to my Oracle Exadata Express url. I don't want to let the world wait to know about our project, so I want to setup a landing or launch page. This page serves as a home while we are building our application. People can already register, so once we are live, we can let them know about it. Either you have an idea about how you want the page to look like, or what I do as well, is look at other sites or templates created by others. For example for the APEX Office Print website we bought a template as starting point and integrated it in our APEX app. If you know some graphic design people, they can obviously help too :) It's easy(ier) to recognize good design, but it's hard(er) to create it yourself. I like minimalist design or "less is more". If you look at the multiplication table project launch page, only the bare minimum is on the page: a title, a graphic, a text item to leave your email and a button (and a text to let everybody know it was built with Oracle APEX. You find some more examples of minimalism here or just Google for it and you find plenty. 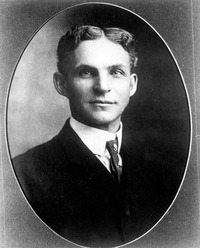 Typically you will see a background picture and a text. If you find a template you like, you can look at the HTML and CSS and copy this in your own APEX page. The font you use is really important and can make a huge difference. Google Fonts are a good starting place to pick a font. In our project I used the Raleway font. In the last month (that I know) two other people showed how to build a landing page in APEX: Stefanie used a background picture and Richard used a video as background. When I look again at our launch page, I would probably tell you it would take me less than 30 minutes to build it in Oracle APEX. If you know what you will build, yes, but if I told you it took me well over 6 hours to build this landing page, would you believe me? It's the truth! So where did I spend all my time then? I first started to search for a design. I didn't really want to copy something from a previous project, but rather wanted to get a fresh new design, so I started to search, and search and search more. Finally I gave up on the idea and followed my own thoughts to do it very minimal and as close as possible to universal theme that comes with APEX. This goes fast (if you know a bit of APEX). As I wanted the image on the left of the items and the items going down a bit, I used two regions next to each other. I looked at the result and didn't like it, so I added some CSS and searched for another font. This was a lot of trial and error till I was happy with the result. Once that was done, I looked how responsive it was. On a smaller screen, I didn't find it looked good enough, so I added a media query and custom CSS, so it would look better. Oh, before I forget, whenever you build an app in Oracle APEX, include the plugin built with love using Oracle APEX. Next up, I had to include a validation (to check if the email already exists), a process and a branch. Now here's a story too... I first started with adding a dynamic action on the Subscription button that would insert a record, but during testing I found I lost the value required and is email validation that you get for free when you submit your page, so I changed it to be a normal process. Finally I changed on the page that duplicate submissions are not allowed. So the end result is we have one very simple page in APEX, using standard components (regions, items, button), 1 plugin (built with APEX), Universal Theme and a bit of custom CSS. 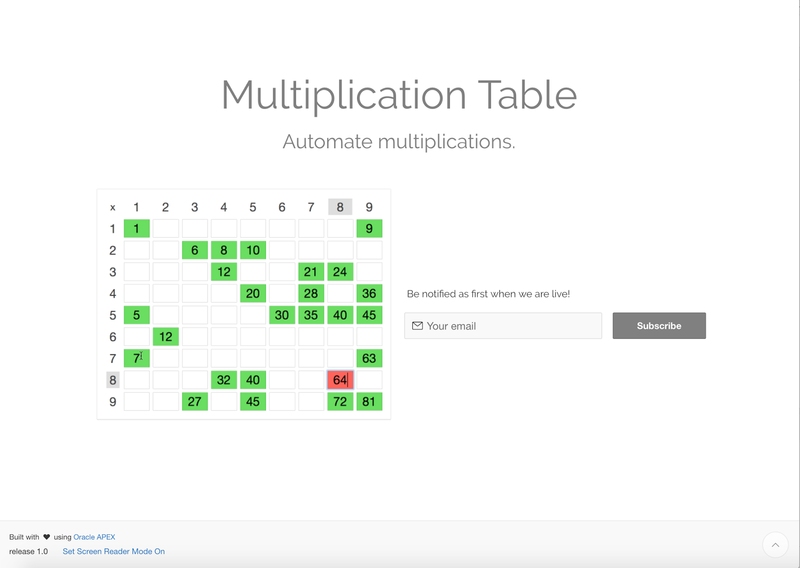 In a previous post we defined the ERD of the multiplication table application we're going to build. 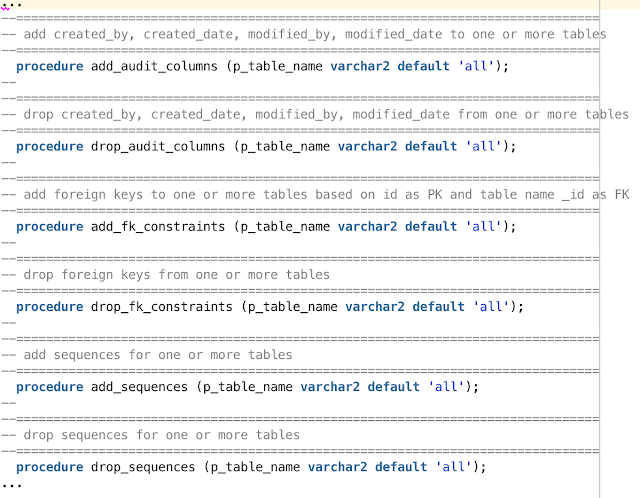 Now I want to go into detail how I create the Oracle database objects like tables, foreign keys, sequences, triggers, etc. Before I tell you what I do today, let me first walk you through my history so you understand why I'm using it. Data Modeling Tools allow you to visually create your tables, relationships, etc. If you work with Oracle for 10 or more years, you probably know Oracle Designer. This tool has been really popular, but today it's legacy and not maintained anymore by Oracle. 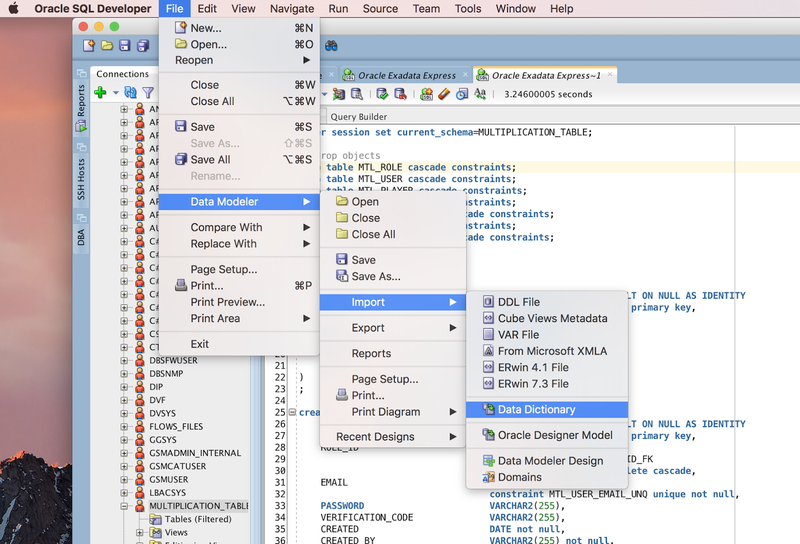 Oracle moved forward with SQL Developer Data Modeler. Although I've been using those tools in the beginning, today I typically don't use them anymore, except for generating a visual diagram (ERD) of my tables, but that is now part of SQL Developer, so I don't have a data modeling tool installed anymore. The main reason for me was, it took me so much time to add the entities, that it was too slow for my process. As written earlier, I typically draw my entities on a whiteboard or piece of paper, after that I want to get going with real tables and data as fast as I can to verify the model. If you have a big team and somebody is solely responsibility for modeling, I see a benefit of using a modeling tool or if you like the process of visually creating a model. There're probably more advantages using a modeling tool, so if you use it and like it, don't change because of this blog post, I just share how I typically do a project. You find the complete guide of my naming conventions here. Those naming conventions were the base, but per project or customer we could adapt to their standards. The principle was that I created tables with only the relevant columns, a meaningful unique key and a comment. The only reason I could do this, was because I used strict naming conventions e.g. table_id column (fk) would be a reference to the id column of a table (pk). By doing this, I could really iterate fast on creating and adapting tables, it worked great for me. The final step was to create a visual ERD of it in SQL Developer (or other tool) as it was easier to communicate with the team and we always include it as part of the documentation. But before we move on, a final word on naming conventions; it's not which naming conventions you use that is important, it's more about being consistent within your project and make it easier for you to understand your model and have faster knowledge transfer. So whatever naming conventions you use is fine, there's not something like "this is the best" in my view. So now we come to today... this little tool is what I use to create a script for my database objects. Quick SQL enables you to rapidly design and prototype data models using a markdown-like shorthand syntax that expands to standards-based Oracle SQL. You can easily create master detail relationships, check constraints, and even generate sample data. 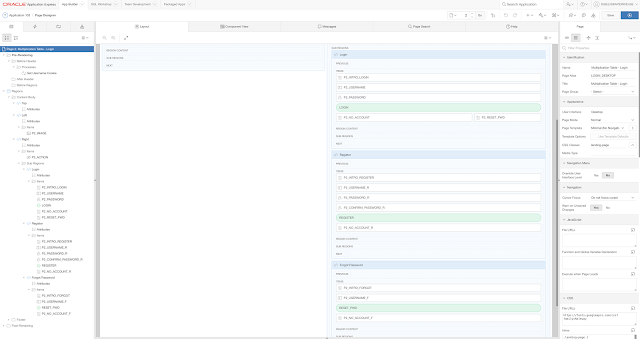 Next you start typing your tables and columns and some additional syntax to specify constraints etc. The power of Quick SQL is that it not only generates the tables, but it has built-in naming conventions, generates indexes, constraints, triggers, views and even sample data. 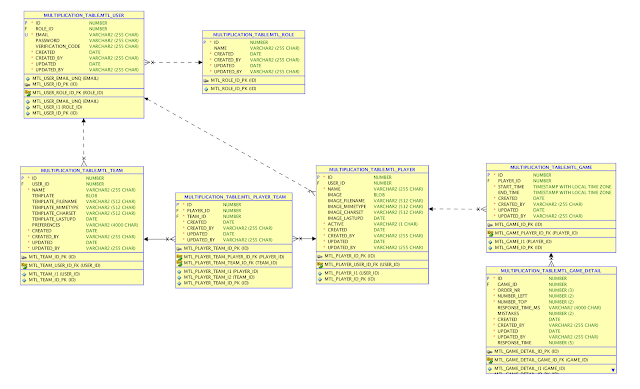 While reviewing the visual ERD, I saw I made a small mistake in Quick SQL. I didn't specify timezone with local timestamp (tswltz), but just timezone with timestamp (tstz). 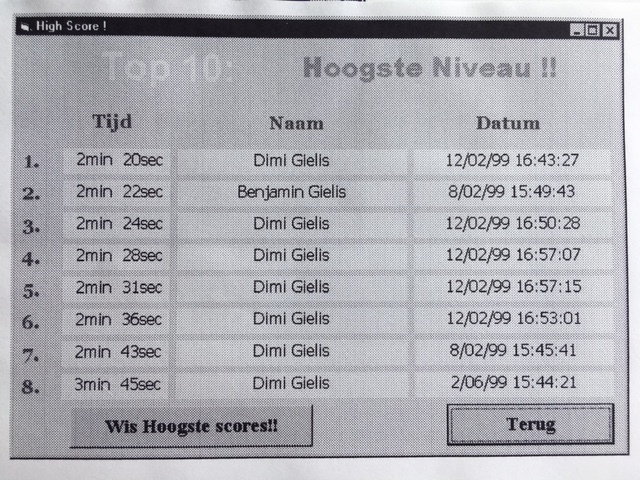 In the application for my son I used a date for that column, that is why I called that column start_date and end_date, but the more logical name is start_time and end_time, so I changed that too. I want to use timestamp with local timezone as this app is probably going to be used around the world, so it would be nice if you could see the time you actually played in your own timezone. 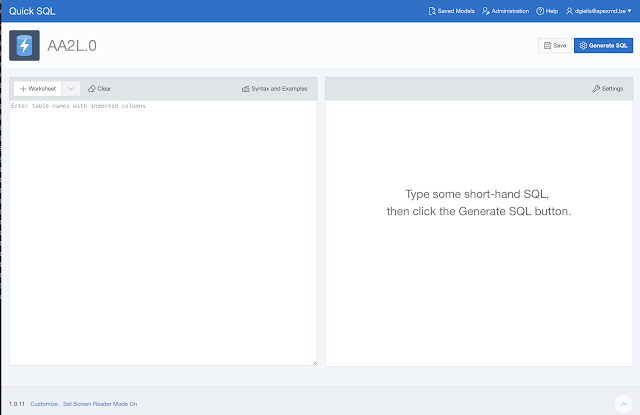 I really like Quick SQL and I hope it gets even more improved in the future. It would be really nice to version control the scripts and be able to generate the differences for the tables (alter statements instead of create statements) or do reverse engineering of a specific schema. Another improvement I hope to see in the future, is the ability to define unique constraints on multiple columns (or it might be already there, but that I don't know how to use it?). In this post we went from the paper ERD to real Oracle objects. Now we are ready to build our app. A development environment can mean different things to different people. You can read the definitions on Wikipedia, TechTarget, Techopedia to name a few. For me, it means on one side you need an environment where you can develop in. 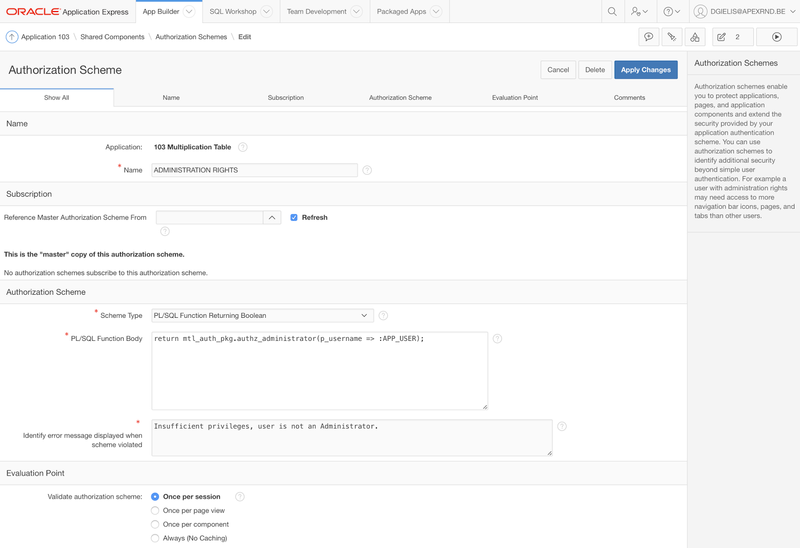 In case of an Oracle APEX project this means, you need at least an Oracle schema and an APEX workspace linked to the Oracle schema in which you can create your APEX application. Now if we take this a step further, it means you need an Oracle Database and APEX installed, which includes a webserver and ORDS (Oracle REST Data Services). And again one level higher it means you need a machine (that is most likely connected to the internet). 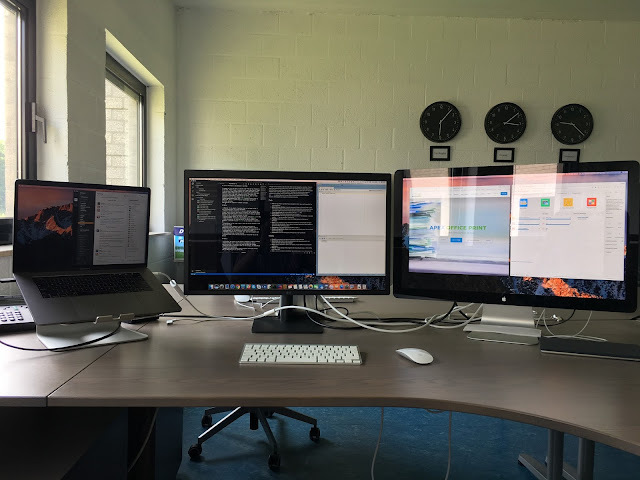 On the other side you have everything around it: some tools you use, something to plan and track the development, something to store your code (version control), something where you can collaborate with other team members. If we include this we talk more about software development in general which touches on application life cycle management (moving to Test, QA, Production). I will walk over the different options we have when doing an APEX project. You basically have your own machines and installed all software on there and you manage everything yourself. Many of my customers still have an on-premise infrastructure. Unless you see our laptops as on-premise, at my own company we never had on-premise, we've always been in the cloud. While running in the cloud you still have different options of the level of responsibility and flexibility you have yourself. We use cloud services from Amazon, Microsoft Azure, Digital Ocean and the Oracle Cloud. More on that further on. Another fast way of being up and running is to download the Oracle pre-built Developer VM for Virtual Box. Everything is already setup for us, but we would need to put it somewhere on a server where it can be accessible through the internet by more people. I typically don't use this solution to do my development, only to test something locally. 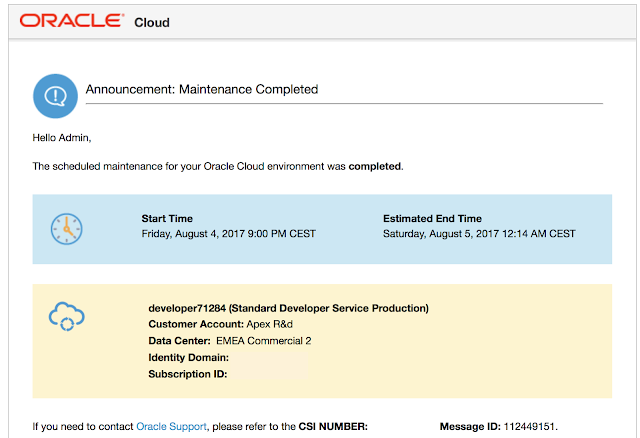 This service from Oracle has been announced a few months ago, but is not yet available at the time of writing. The rumours are you get 1GB of data, have APEX 5.1 or higher, you're running in the Oracle Cloud and can run production applications there. This solution would have been ideal for our multiplication table project! The biggest benefit of an Oracle XE infrastructure, it's a very cheap solution, the downside is that Oracle XE is still Oracle DB 11g with many restrictions, so we can't use some 12c features (like JSON in DB, ...). Rumours are there will be an Oracle XE 12c version coming out in the future. Maybe even more important to know; there's no Oracle support for this database. Although at first sight you might not need it, it also implies you can't download Oracle APEX patches, as you don't have a CSI number. If you have a CSI number for another infrastructure and downloaded the APEX patches, you can obviously patch your APEX in Oracle XE. If not you would need to download and reinstall the full version of APEX every time, which becomes time consuming. So lets look at our multiplication table project, we can definitely use OXAR for this as it fits within the XE limits. I subscribed at Digital Ocean for a CentOS Droplet for 10 USD/month and ran OXAR on there. It took me about 1 hour to be up and running (mostly the OXAR script was running by itself). Docker has gained a lot of popularity in the last years (since 2013/2014). Docker is a tool designed to make it easier to create, deploy, and run applications by using containers. 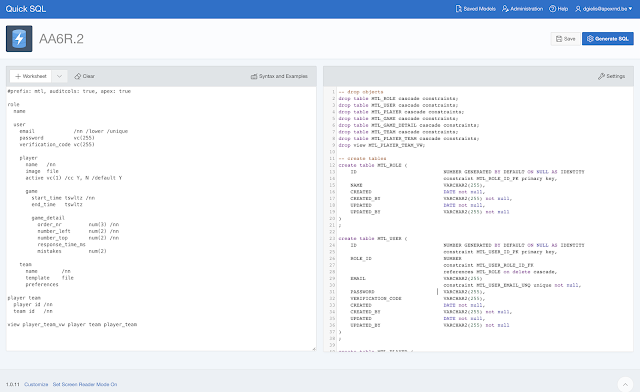 Oracle provides official Docker Images for many of their products, see also the Docker store. If you're new to Docker, you can read more here. I also like this article which covers the main benefits of Docker. You can also watch this video how to build and deploy an Oracle Database Docker Image to the Oracle Container Cloud Service. So far I've used Docker only for test instances. I typically use the docker image of Daniel Hochleitner (aka Mr. APEX Plugin). Daniel itself says his docker image isn't very "dockerish" because installing all components in one container is not the concept how it should work, so the benefits of microservices, security, single components and things like that are lost in a cloud environment with this particular docker image. But the nice thing about this image, just like OXAR, it includes all you need: ORDS, APEX, Tomcat, AOP, ... For me this image is ideal to test something quickly. A docker container has less overhead than a full VM and you still have some benefits of Docker. For the multiplication table project I won't use this option. But I did want to cover it, as it might be a good solution for you, especially if your company is already into containers. Oh and did you know Docker has a competitor too? It's called rkt, we will probably hear more about that in the coming years. Next to Oracle, there're a number of hosting companies that provide Oracle APEX hosting, but I've no experience using them for my own projects, but it might be an option for yours. I know some AOP cloud customers that connect from their SkillBuilders, Revion and AppsHosting account. As previously mentioned in the on-premise section, there're a number of options you have. You can just go with a (virtual) machine, or a machine that is pre-configured, a complete managed machine and database etc. They also call it infrastructure as a service (IaaS), platform as a service (PaaS) or software as a service (SaaS) or data as a service (DaaS). For an Oracle APEX project it's most important you have the Oracle database. Oracle put the last few years a lot of focus on the cloud, here you find the Oracle Database Cloud offering. There're also alternatives by many other providers for example Amazon AWS: EC2 (virtual machine), RDS (managed database) etc. In the next section we go in more detail with one of the Oracle's offering. But that is not all... you get more, you get a complete development infrastructure, meaning part 1 and part 2 I touched on at the start of this blog. So you can manage the full development life cycle with this service. You have a Git repository, can do the planning, capture issues, do automated builds etc. 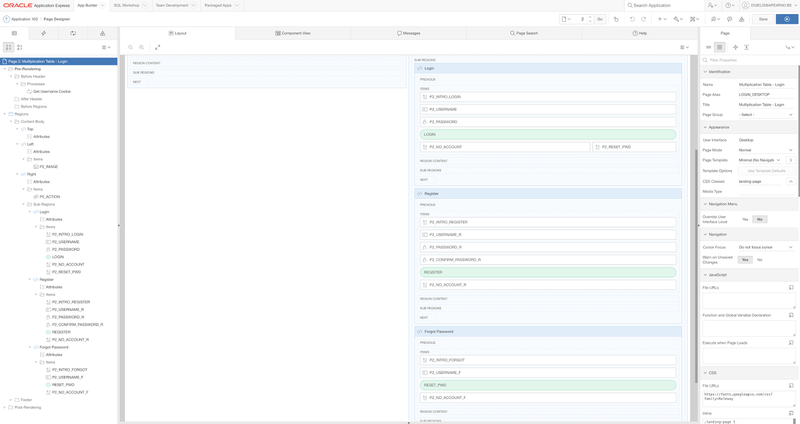 On the management part of the development process; doing the builds, tracking the issues etc. you can definitely set this up yourself, and there are many options you have, from open source to probably most known, the Atlassian stack with Jira, Confluence, Bamboo etc. but this comes with a cost too. At APEX R&D we use different tools depending the project and customer. 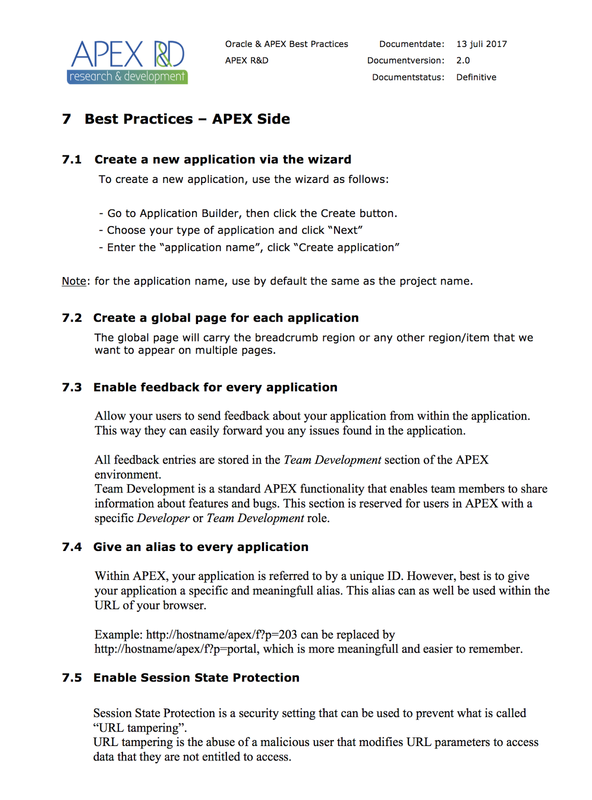 Two years ago, for AOP we started with Team Development which is part of Oracle APEX to define the features, gather feedback and define the releases. But we extended with other tools now like Trello and Bitbucket which stores our Git repository and we started to use the issue features there too. In some other projects we use Jira or Redmine. There're so many tools to manage your development life cycle, at some point you just have to make a choice. At the end of the day most tools are good, it comes down to personal preference. 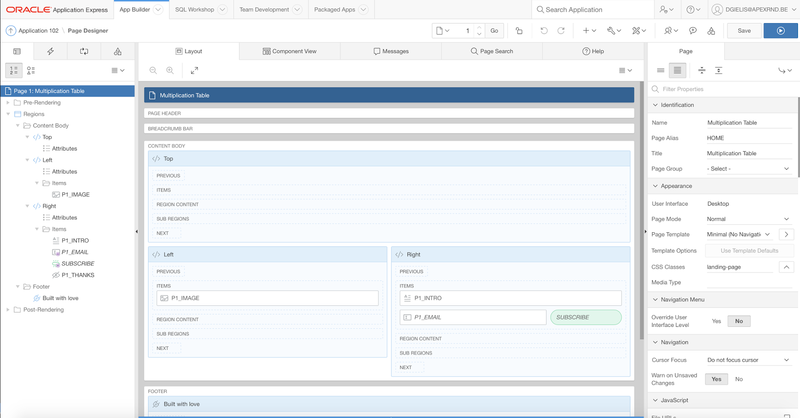 Whenever our project involves Oracle Exadata Express, my choice will be to use the tools that come with the Oracle Developer Cloud Service, as that is included and I don't need to setup anything else anymore. From a maintenance and cost perspective I find it really appealing. On different Oracle conferences this year, I've given a presentation how to move your APEX app to the Oracle Exadata Express Cloud. Is this solution perfect yet? No, there's still room for improvement. For example I would love to have some more EE features available (RAS, Flashback data archive for example), an easier way to point to a custom URL and a customizable backup strategy. Oracle is improving every month and for many projects the current feature set is more than enough. As the multiplication project has both an educational side to show you how I do APEX projects and is also a real use case, I'll use the Oracle Exadata Express service. Ok, this post is getting close to 2000 words... if you read till here, great! I hope I gave you an insight in the different options you have to build your APEX infrastructure. If you have any questions or remarks, don't hesitate to add them as comments to this post. When doing development, it's not about the tools, it's about mindset. Tools can help achieve a goal, but which tool to use depends on you and how you work with them. I love to hear what and how other people are using tools to get the job done. Martin D'Souza showed in this podcast how he works with Atom (text editor) and why you should use it. I loved the podcast, Martin is a very smart guy and good developer, but you can look at this podcast in two different ways. You can look at it and say, I'm going to use Atom now, and work with Atom the same as you did in Notepad, or you can look at the principles he explains why he went with Atom and apply it to your editor of choice (which might be Atom, Sublime or another). I recently switched to Visual Studio Code as my main editor, because for me it worked better in the job I have to do a lot (read large JSON files, work with Markdown and Git). Does it mean everybody should switch? Not at all, whatever works for you. So having said that, I thought it would be nice to list the (software) tools I use and order them by how frequently I use them. There're apps I use multiple times a day (daily), some I use multiple times a week (weekly) or just a few times a month (monthly). While compiling this list I also saw I still have apps installed I don't use that frequently at all. The below list contains only desktop applications I installed on my laptop, next to those programs I also use some webapps like Bitbucket and Trello to name a few, but I'll cover those in future posts as part of different sections. Same applies for plugins or command line apps. Note: I've a Mac laptop with macOS, so the below applications might not exist for Windows. Mail: for my emails I use Mail that is included in OSX. I also use Google Mail for other mailboxes. Safari (Chrome, Firefox): I typically develop in Safari or Chrome. Safari is a bit more battery friendly, but Chrome has beter developer tools and plugins. Firefox I use when I need just another browser to see if something behaves the same. The above are just some tools that help me doing my job. Over time I changed tools and will most likely use others in the future. So depending when you read this (after 2017) things might have changed. Feel free to share your favorite tools in the comments section.